Figure 1. Generation of nephrin and NEPH1 fusion proteins. The Ig and fibroncectin (FN)-like domains were predicted using the SMART prediction program (http://smart.EMBL-Heidelberg.de/). All constructs containing the amino-terminal domains of either NEPH1 or nephrin include the authentic signal peptide (SP). The carboxy-terminal Ig domains were fused to the carboxy-terminus of the CH2 and CH3 domain of human IgG. To target these constructs to the secretory pathway, the fusion proteins were preceded by the leader sequence of CD5 (black box) (10,11 ). The constructs Nephrin.ec.Fc and NEPH1.ec.Fc contain the entire extracellular (ec) domain of either nephrin or NEPH1. Figure 2. Expression of nephrin and NEPH1 fusion proteins. (A) Expression of NEPH1 and control fusion proteins in HEK 293T cells. Lysates were prepared after 24 h of incubation and separated on SDS-PAGE. Western blot analyses were performed with a HRP-coupled antiserum directed against human IgG. The control protein sFc.7, a fusion protein containing the CH2 and CH3 domain of human IgG, is extremely well expressed, typically resulting in a smear. (B) Expression of nephrin and control fusion proteins in HEK 293T cells. Lysates were prepared after 24 h of incubation and separated on SDS-PAGE. Western blot analyses were performed with an HRP-coupled antiserum directed against human IgG. Figure 3. Glomerular localization of NEPH1 and the ligand of NEPH1. 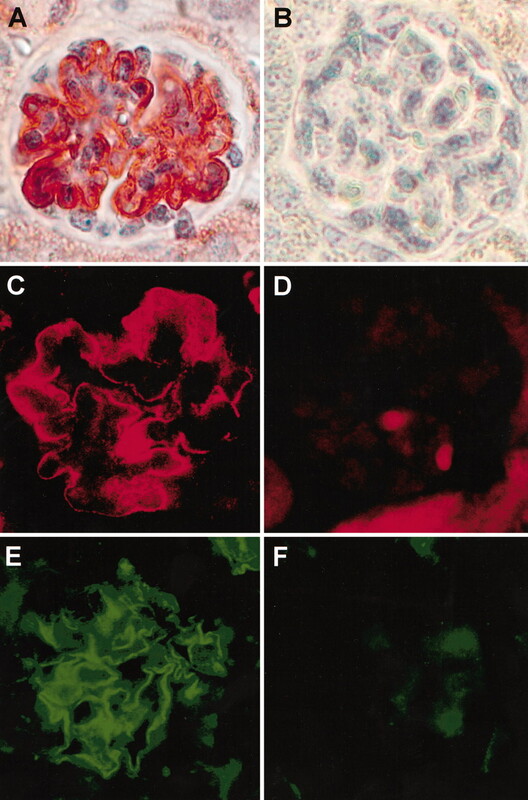 (A and B) Glomerular distribution of NEPH1 in the mouse kidney at 4 wk of age by immunohistochemistry. The anti-NEPH1 antiserum outlines the glomerular basement membrane in a pattern similar to the reported distribution of nephrin and podocin. The control rabbit antiserum reveals no significant staining of mouse renal tissue. (C and D) Glomerular distribution of NEPH1 in the mouse kidney at 4 wk of age by immunofluorescence. The anti-NEPH1 antiserum outlines the glomerular basement membrane, while the control rabbit antiserum reveals very little background staining. (E and F) Glomerular distribution of the putative ligand of NEPH1. Frozen sections of the mouse kidney were incubated with affinity-purified NEPH1.ec.Fc (E) or human IgG (F) at a concentration of 20 μg/ml. Both sections were subsequently labeled with a FITC-conjugated secondary antibody directed against human IgG. The NEPH1.ec.Fc, but not the control serum, revealed a highly specific labeling of the glomerular basement membrane in a staining pattern identical to the staining pattern obtained for the anti-NEPH1 antiserum (C). Figure 4. Homodimeric and heterodimeric interactions of NEPH1. (A) The NEPH1 fusion proteins precipitate NEPH1. The NEPH1 fusion proteins, containing either the entire extracellular domain of NEPH1 (NEPH1.ec.Fc) or truncations of the extracellular domain of NEPH1, were co-expressed with the Flag-tagged version of NEPH1 (NEPH1.F) in transiently transfected HEK 293T cells. Cellular lysates were incubated with protein G to precipitate the NEPH1 fusion proteins. NEPH1.F, bound to NEPH1.ec.Fc, was detected by Western blot analysis, using the M2 anti-Flag monoclonal antibody. All three NEPH1 fusion proteins, NEPH1.ec.Fc, containing the entire extracellular domain of NEPH1, NEPH1.Ig1+2.Fc, containing the N-terminal three Ig domains of NEPH1, and sFc.NEPH1.Ig3+4, containing the third and fourth Ig domain, precipitated Flag-tagged NEPH1. In contrast, both control proteins, sFc.7 and PKD. Fc, failed to immobilize NEPH1.F. 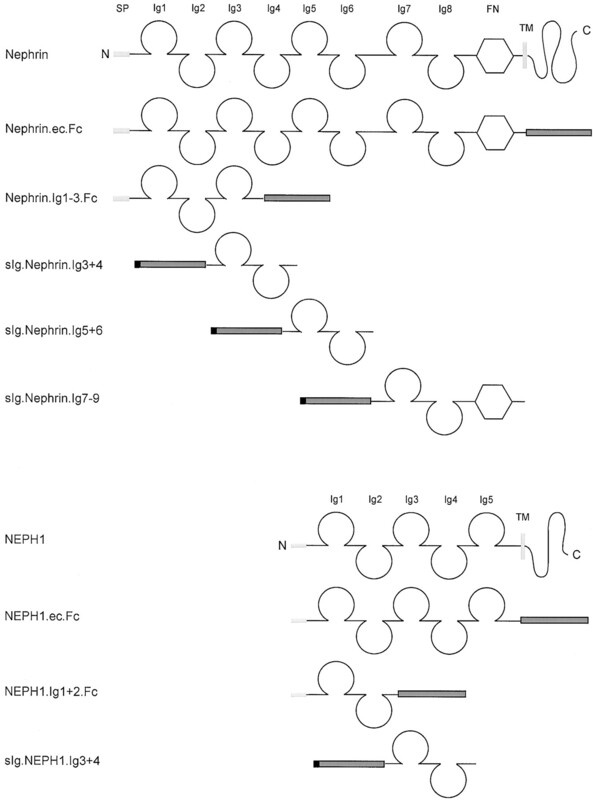 (B) The NEPH1 fusion proteins precipitate nephrin. The NEPH1 fusion proteins were co-expressed with Flag-tagged nephrin (Nephrin.F) in HEK 293T cells. Again, all NEPH1 fusion proteins precipitated Nephrin.F, whereas the two control proteins failed to interact with nephrin. (C) Nephrin fusion proteins precipitate NEPH1. Nephrin fusion proteins were generated to test the NEPH1-nephrin interaction after immobilization of nephrin. Co-expression of Nephrin.ec.Fc, containing the entire extracellular domain of nephrin, or fusion proteins, containing individual nephrin Ig domains as indicated, immunoprecipitated the Flag-tagged NEPH1. Both control proteins failed to precipitate NEPH1, although the NEPH1 expression was higher in the controls than in the presence of the nephrin fusion proteins. (D) Interaction between NEPH1 and nephrin in vivo. Lysates prepared from mouse kidneys were incubated with anti-nephrin antiserum and subsequently precipitated with protein G. Immobilized NEPH1 was detected by Western blot analyses, using a NEPH1-specific antiserum, indicating that at least a small fraction of nephrin and NEPH1 appears to interact in vivo (upper panel). Addition of ATP to the lysis buffer appeared to increase the amount of immobilized NEPH1 (lower panel). Figure 5. Nephrin forms homodimers. HEK 293T cells were transiently transfected with Flag-tagged nephrin and the nephrin fusion proteins as indicated. The Nephrin.ec.Fc fusion contains the entire extracellular domain of nephrin fused to the CH2 and CH3 domain of human IgG, whereas the other fusion proteins contain the Ig domains 1 to 3, 3 and 4, 5 and 6, or 7 to 9 fused to either the N-terminus of CH2 (Fc fusions) or the C-terminus of CH3 (sFc fusions). Protein G was used to immobilize the fusion proteins, and Western blot analyses were performed to detect precipitated nephrin, utilizing the Flag-specific M2 monoclonal antibody. (A and B) Flag-tagged nephrin (Nephrin.F) interacts with nephrin fusion proteins that include either the entire extracellular domain of nephrin or fragments of the extracellular domain of nephrin. 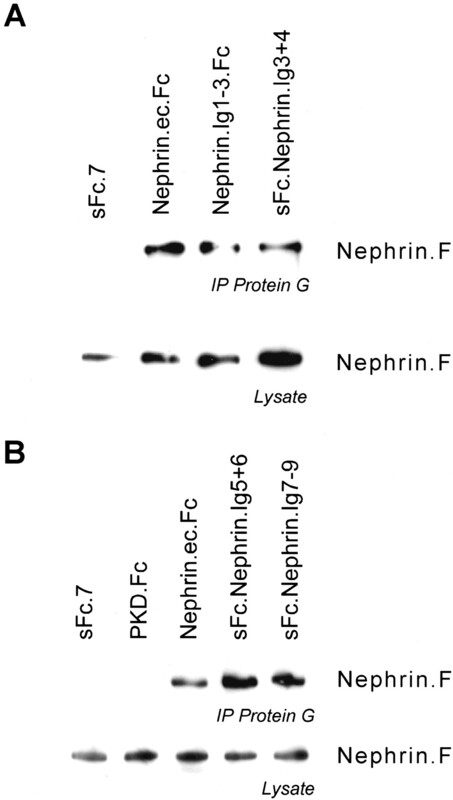 In contrast, the two control proteins, sFc.7 and PKD.Fc, did not interact with nephrin. Figure 6. The NEPH1-nephrin interactions require post-translational glycosylation. (A) NEPH1 is N-glycosylated. HEK 293T cells were transiently transfected with Flag-tagged NEPH1 and precipitated with the Flag-specific M2 monoclonal antibody. Treatment with PNGase F resulted in a significant decrease of the molecular weight of NEPH1, confirming that this molecule is heavily glycosylated. (B) The extracellular domain of NEPH1, expressed in HEK 293T cells (NEPH1.ec.Fc), but not recombinant NEPH1, expressed as a maltose-binding protein fusion (MBP) in Escherichia coli (MBP.NEPH1.ec) interacts with nephrin or NEPH1. Cellular lysates of HEK 293T cells, expressing either Flag-tagged nephrin or NEPH1, were incubated with the control protein sFc.7, NEPH1.ec.Fc or MBP.NEPH1.ec, immobilized to either protein G or amylose resin. NEPH1.F only interacted with NEPH1.ec.Fc, but not with either the control protein, or the recombinant MBP fusion protein. (C and D) PNGase F treatment abolished the interaction of NEPH1 and nephrin with the NEPH1 fusion protein. The NEPH1.ec.Fc was immobilized to protein G and treated with PNGase F or buffer, lacking the enzyme. PNGase F-treated NEPH1.ec.Fc failed to precipitate either Flag-tagged nephrin (Nephrin.F) or NEPH1 (NEPH1.F), expressed in HEK 293T cells.